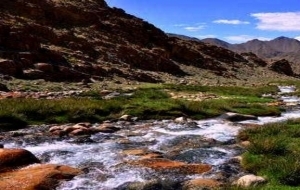 Tour route: Shy, Thiksey, Hemis, Shang, Ltaza Kongamaru, Nimaling, Langtangchu, Khar, Dat, Lunngmoche, Jabuk, Base of Marangla, Tsogmirtsig, Jukthak, Sarchu, Patseo, Darcha are the highlights of this package. Morning transfer to the domestic airport to board flight for Leh. On arrival transfer to hotel at Leh. Free day to acclimatized. Morning visit Shey, Thiksey monasteries, after lunch visit Tibetan handicraft Centre. Evening free. About 4 hours. The ascent to the top of the Kongmarla pass(5150 mtr) is steep. The descend on the otherside is gradual. Nimaling is one of the most beautiful high valleys in Ladakh. It is the summer camp of the shepherds of Markha Valley. One can find plenty of yaks grazing around. From Jabuk we get to Lun in a short while. From Lun the trek leads to a beautiful plateau. The ascend to the Marangla from the Plateau is steep at first, which becomes gentler as we approach the Marangla Pass (5200 meters). Camp at the base of Marangla. It is a 6 hours trek. Cross pass of Marangla. About 5 hours easy trek Overnight at Jukthak. About six hour’s easy trek to reach Sarchu just sandwich between Leh - Manali road. Day 15	Sarchu - Camp. Morning drive from Darcha to Manali. Good bye to horses and Sherpas. Check in hotel. Evening free for own activities.